What if you could increase your investment returns more than 200% by simply understanding the role of luck versus skill in investing? If ever there was information the securities industry didn't want you to have, this is it. Several recent studies have demonstrated conclusively that almost every mutual fund that outperforms the market is just lucky. No investment skill is evident. The same can be said for brokers and other "investment pros" who claim to be able to time the markets, pick outperforming stocks or select mutual funds that will outperform other funds. One study, discussed in an article in The New York Times, looked at the performance of 2,100 actively managed funds over a 31-year period. The highly credentialed authors of this independent study concluded that only 0.6% of the fund managers studied had genuine stock picking ability – a number which is statistically indistinguishable from zero. The article noted: "Professor [Russ] Wermers [of the University of Maryland] says his advice has evolved significantly as a result of this study. Until now, he says, he wouldn't have tried to discourage a sophisticated investor from trying to pick a mutual fund that would outperform the market. Now, he says, 'it seems almost hopeless.' 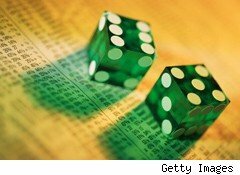 "
A recent study by business professors Eugene F. Fama of the University of Chicago and Kenneth R. French of Dartmouth, Luck versus Skill in the Cross Section of Mutual Fund Returns, looked at the effect of luck in the performance of actively managed funds. When luck was excluded, the authors concluded as follows: "Going forward, we expect the remaining 97% of the active fund universe to perform worse than comparable efficiently managed passive funds." 55% of them had one period when they outperformed and one period during which they underperformed. If skill was the core reason a given fund outperformed the crowd during one 10-year period, almost 100% of those successful funds would have repeated the accomplishment in the second 10-year period. The cold, hard fact is they were just lucky. By random chance, some mutual fund managers will be able to beat the market. Approximately 300 out of 10,000 coin flippers will call 5 consecutive coin flips correctly. They have no psychic powers: They're just lucky. These findings have meaningful ramifications for investors. A study released by Dalbar in March 2010 found that, during the 20 years from 1990 through 2009, the average stock fund investor earned returns of only 3.17% per year, while the S&P 500 returned 8.21%. On an inflation adjusted return, the average equity fund investor increased to only $108,743 on the value of a $100,000 investment made in 1990, while the inflation adjusted growth of $100,000 invested in the S&P 500 would have been $281,979. The reason for the poor returns of the average stock fund investor is the inability to distinguish between luck and skill. These investors chase returns, relying on brokers and advisers who tell them they can "beat the markets." They persuade them of their ability to do so by pointing to past returns and implying those returns will persist in the future. They might, if they were based on the skill of investment manager. They don't, because virtually all of those managers were just lucky. Once you understand the mesmerizing -- but misleading -- attribution of skill to results in which luck was the prime factor, you will fundamentally change the way you invest. By simply capturing market returns, using low-cost index funds in an asset allocation appropriate for you, you can turbocharge your returns. That's a skill every investor can implement.